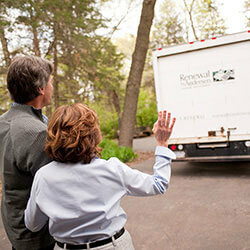 Renewal by Andersen is a full-service company committed to redefining the window-replacement experience. A division of the most trusted family of window brands in America-The Andersen Corporation-Renewal by Anderson is backed by 113 years of experience to provide window-replacement solutions for any home. Why Renewal by Andersen Windows? Weathertight Fibrex® window frame material is twice as strong as vinyl windows, maintaining its stability better and longer to protect against even the most extreme temperature conditions. Fibrex® durability means more glass supported by narrower frames, giving your room the largest possible view from your home’s windows. Plus, the extrusion process fuses color into the material for long-lasting vibrancy. Choose from a wide palette—including hard-to-find dark exterior colors. This process also allows Fibrex® to be molded into various shapes. Whether you want to match the architectural style of your house or opt for a more modern look, Renewal by Andersen replacement windows are made to fit you. Renewal by Andersen windows are warranted to stand the test of time without flaking, peeling, or cracking. We guarantee that your windows will operate just as smoothly in 20 years as the day they were installed. Meet with a design consultant in your own home to determine your ideal structure, style, and material. 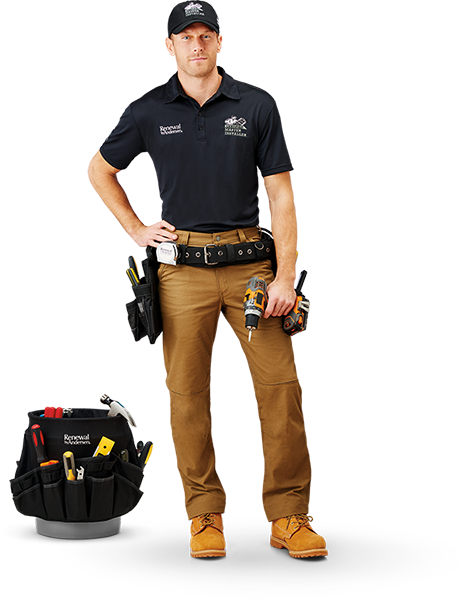 A project technician will then reinspect and measure your space with attention to each of your needs. Enjoy peace of mind with easily accessible customer care and a limited warranty. Renewal by Andersen windows are designed with energy costs in mind—both personal and environmental. Save money on heating and cooling as our replacement windows reduce summer sun exposure and increase insulation in winter by up to 70%, keeping you and your family comfortable in every season. 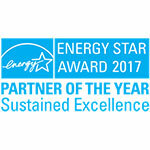 As the first window manufacturer to be Green Seal certified, Renewal by Andersen is dedicated to overall energy efficiency. Our High-Performance Low-E4 glass is our most efficient in extreme temperatures while Fibrex-made with reclaimed wood fiber-reduce waste and protect your home with a seal twice as strong as vinyl. These features combined result in better in-house temperature control, less strain on your appliances, and more environmental sustainability. All appointments were on time and professional. The whole project was laid out & up front; no hidden charges. Installation was fast, professional, courteous. Very satisfied & a satisfying experience. Your employees ( Ryan and Cody). Did a wonderful and thorough job on our windows. They were careful and respectful. Also respect my house, were responsive to our many questions and explained what we needed to know. We will recommend Renewal by Andersen to anyone looking for new windows. Thank you Ryan and Cody for a job well done. From the Sales Team, through to the Installation; ALL members represented Renewal by Andersen very well. The Price Point was on the upper end; however, the service, control, and Guarantees under ONE Organization is the largest reason we selected this company. We are very pleased with our choice and the professionalism from start to finish. Plus the installers (Ryan W. and Cody D. out of SPOKANE, WA) were fun, informative, and extremely knowledgeable out what they were doing. Zero complaints. Great work all the way across the board. Our entire experience with Renewal by Andersen was wonderful. Our only negative comment has to do with our initial contact with someone on the phone when we called to make our initial appointment. That person wasnât helpful. After that, all the people we met were great. Whatever you pay our installers, Vince & Jesus, it isnât enough! The installers were prompt, detailed, courteous, and professional. Everyone was courteous and professional! Results are really great. Very pleased with the entire process. Love the windows and slider. Great follow up by RbA Staff. 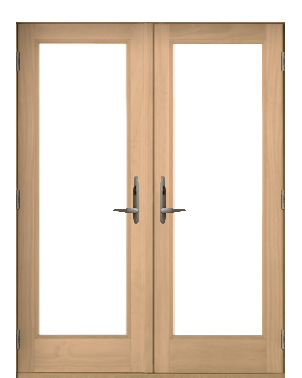 Since my home has dark wood work throughout - I would like to have had a choice between the pine finish on the patio doors and a dark version. However the pine finish is beautifully done - and looks are outstanding!! They worked so very hard to get the well-finished look for them - and successfully!!! The result was doors to be very proud of. Thank you. Installation crew did a great job. Lived up to their billing as Master Craftsmen. Went out of their way to ensure we were completely happy with the final product. Everyone we talked to with Anderson was extremely helpful. A real Team effort with very satisfying results. I want to thank Renewal by Anderson. I feel so special because you sent me your best installers. Ryan B and Cody D were amazing! Besides being amazing at installing the windows and the sliding door, they went above and beyond to make everything perfect. When they left each night and when the job was done they left my house cleaner then when they started. They were kind, thoughtful and helpful. They replaced windows that were original when my house was built in 1979. There were some really quirky construction issues that they came up against but went above and beyond to resolve the issues and make my windows look top notch! Thanks again for sending your two best installers to my house! From the first meeting and demonstration through the measuring and the final installation, every interaction was professional and reinforced the quality of my purchase. I could not be happier with the results and appreciate how it has made life so much more enjoyable during a hot summer, made a basement room much lighter and pleasant, and made my home look 1000 times better. Choose Renewal by Andersen for your next home update. We’ve mastered every step of the window replacement process—so you don’t have to. One call is all you need to get your project started. Contact your nearest Renewal by Andersen retailer to schedule the in-home consultation, and don’t forget to ask about special offers! What if the products you use every day could make the planet healthier? And what if they could save you money while doing so? The replacement windows and doors available from Renewal by Andersen offer superior thermal insulating properties which help your home stay warmer in winter, cooler in summer and can help you save money on energy bills. Renewal by Andersen windows are constructed with our revolutionary Fibrex® material which contains 40% reclaimed wood fiber by weight, and they offer long product life cycles, reducing landfill waste, helping to keep the world just a little bit greener. 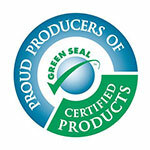 Our windows are Green Seal certified, and available with glass options that make them ENERGY STAR® certified. Compared to typical double pane windows, our Andersen® Smart Sun windows are 44% more energy efficient in the winter and 70% more efficient in the summertime. This cuts down on the amount of energy you need to keep your home at a comfortable temperature. For larger projects, our technicians also focus on one window at a time to ensure that it is fitted properly, and to reduce drafts in your home during the installation process. At Renewal by Andersen, we take every step into consideration in hopes of providing you with the best window replacement process available. Installing, insulating, and sealing each window frame. Then, after a thorough inspection, collecting and disposing of your old windows. Having need of home improvement can be stressful, which is why our well-defined process begins with information. Our customer care and design consultant teams are prepared to answer any number of your questions to help you make the best choice for your home. Through these initial conversations, you can be assured of the value of Renewal by Anderson replacement windows—both in quality and quality of service. When shopping for replacement windows, it’s important to consider their performance over time. While some companies may offer cheap solutions, substandard products and practices often result in additional window replacement within 5 or 10 years—forcing you to restart the process again, or even multiple times. 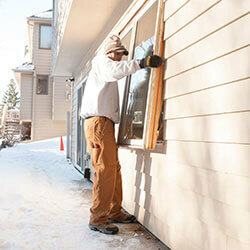 Renewal by Andersen windows are installed once-and correctly-right when you need them. Guaranteed. Contact us today for more information on costs and value. For beautiful, lasting, statement-making styles, look no further than Renewal by Andersen’s specialty and custom replacement windows. With 15 shape options and 49 possible color combinations, we have a window to match nearly every unique vision. 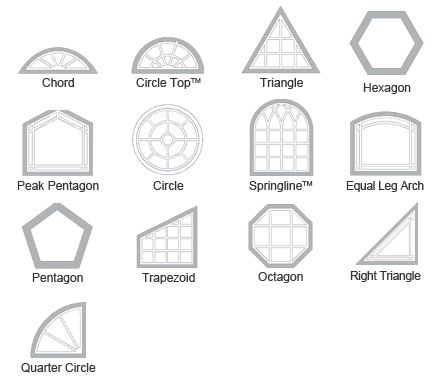 Choose any shape-including arch, circular, and triangular-or combine multiple shapes with functioning windows to give you the best of what each type has to offer. Renewal by Andersen specialty windows are best suited to the homeowner wishing to enhance a room’s character, add curb appeal, bring in more light, or all of the above. Discuss your ideas with a representative to get started today! 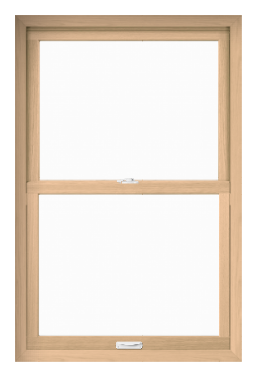 More Than Windows: Renewal by Andersen Offers Hinged & Sliding Patio Doors! Like our replacement windows, our selection of patio doors is designed for optimal quality and versatility. 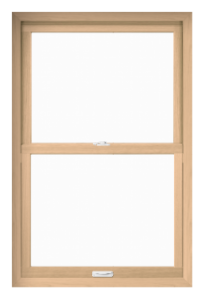 Classic French-style patio doors are available in either hinged or sliding varieties, in addition to modern sliding door types for those seeking a more contemporary look and feel. No matter which you choose, Renewal by Andersen patio doors are fully customizable—from glass and screen options, to color, hardware, and accessories. Be sure to review our patio doors guide for more information and to see them in action.